One's a Brit-voiced distortion, the other's a two-in-one overdrive/compressor. Since its formation in 2001, Keeley Electronics has been at the forefront of the boutique-stompbox boom. Now transforming an indie business into a global empire, this godfather of high-quality effects has put out numerous contenders for best-in-class in their respective pedal categories. The El Rey Dorado started out as a limited-run hand-built pedal, but is now in full production. Emulating hard-rock royalty in the form of a Marshall Plexi, the El Rey Dorado’s target tone in ‘hi’ mode is the Super Lead, while switching to ‘lo’ takes you to JTM45 territory. Featuring three simple controls, in Drive, Tone and Level, this pedal is as solid and scintillating as the amps that inspired it. 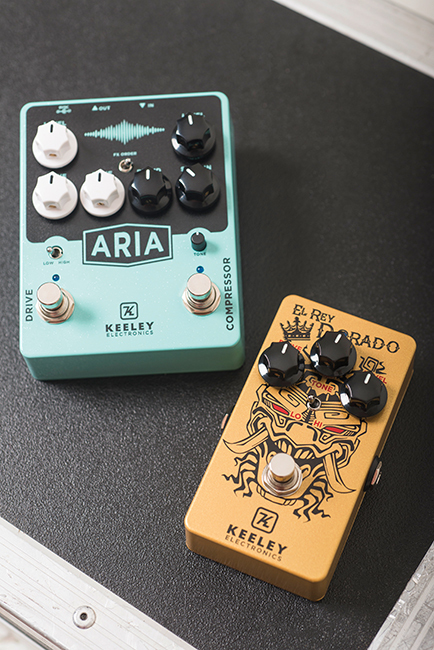 Keeley is synonymous with compression, and the Aria is a serious – and seriously versatile – example of the effect. The right-hand side is a direct clone of the Compressor Plus, with the same four knobs for ultimate control. The left features a valve-like drive similar to Keeley’s Red Dirt Overdrive. A simple toggle switch lets you change the order of the effects, and you can also place other pedals between the compressor and overdrive using TRS cables. Check out our reviews of both pedals here. The closing date is 12.00am GMT, 1 March 2019. The editor’s decision is final. The competition is open to UK residents only. By entering The Guitar Magazine competitions, you are agreeing to receive details of future promotions from BandLab UK Limited and related third parties. If you do not want to receive this information, you can opt out. This giveaway is open to over 18s only. For full terms and conditions, please go to bnd.la/gm-ctos.